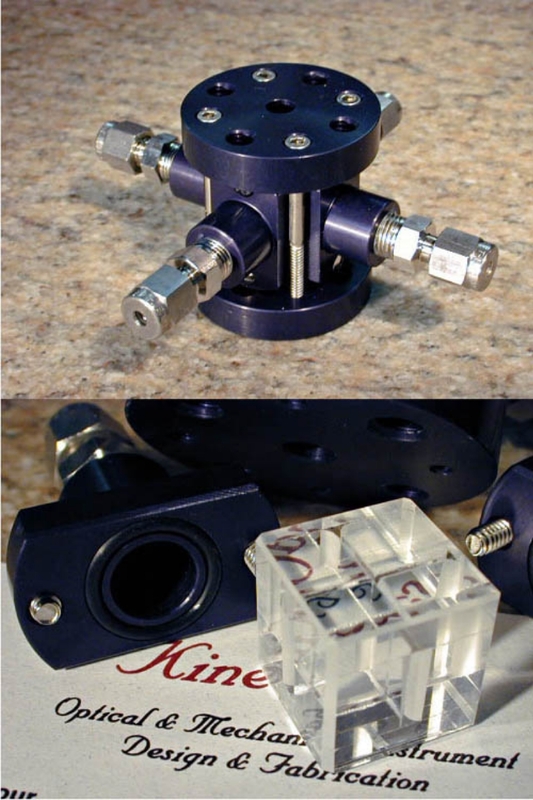 KineOptics designed and fabricated this flow cell instrument for the University of Michigan Department of Chemical Engineering. It consist of four BK7 cubes bonded between two BK7 glass plates which makes the completed glass assembly only 18 mm square. The inside faces had to be polished and the intersection corner edges sharp with no visible bevel. There is a radius on the outside edges of the inlets to provide smooth flow through the cell. The glass assembly is mounted in an aluminum housing with a center aperture for the test laser. There are four aluminum ports with o-ring seals for the test fluid connections.